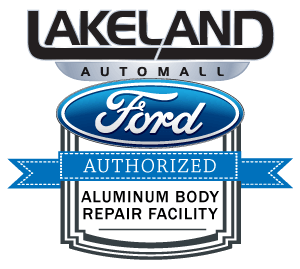 Come visit the new Lakeland Ford Auto Body and Collision Center! We know how difficult it can be to deal with insurance claims after an accident. Let the experts at Lakeland Auto Body take the headache out of an already frustrating situation. We work with all insurance companies and will handled your claim process from start to finish with VIP treatment. Call us to schedule FREE ESTIMATE today! (863) 583-9252 – We Service All Makes and Models! It’s your vehicle and it’s your choice – you decide where to repair your vehicle. Sometimes others will try to persuade you to take your vehicle to the shop of their choice and we want you to know the truth and we want you back on the road with the quality and service you deserve. Our factory certified technicians know your vehicle inside and out and can provide you with the expert service you expect and deserve. We offer limited lifetime warranties on all repairs and can bring your vehicle back to the condition it was before the loss. Don’t settle for less when you can get the best! Our experienced and dedicated staff will provide you with the best customer service possible and keep you up-to-date regarding your repair. We know that you deserve the best and we want to make sure that every customer gets the best. Our state-of-the-art facility can handle the smallest dents to the largest collisions and provide you with showroom new services that make you feel like you never had a problem. Lakeland Auto Body offers free estimates on all makes and models and is dedicated to providing you with expert service, quality products and certified staff are trained to provide you with the best experience every time. Contact us today for a free estimate and experience why Lakeland Auto Body is the preferred auto body repair facility in Lakeland and Polk County. We feature an extensive selection of new and certified pre-owned Ford vehicles, as well as used cars from many other makes. Lakeland Ford is committed to providing superior service in all departments, from sales to finance to parts and service, and we invite you to search through our online inventory and stop by our dealership for a test drive. If you have any questions, please give us a call at (863) 577-5030.